Disclosure: I received a copy of the Blu-ray to facilitate this post. All opinions expressed are my own. Based on a true story, sports agent JB Bernstein (Jon Hamm) finds that business has changed and things aren’t going well for his career. In a last ditch effort to save his livelihood he concocts a scheme to find baseball’s next great pitching ace. Hoping to find a young cricket pitcher he can turn into a major league baseball star, JB travels to India to produce a reality show competition called “The Million Dollar Arm.” With the help of cantankerous but eagle-eyed retired baseball scout Ray Poitevint (Alan Arkin), he discovers Dinesh (Madhur Mittal) and Rinku (Suraj Sharma), two young men who have no idea about playing baseball, yet have a knack for throwing a fastball. Hoping to sign them to major league contracts and make a quick buck, JB brings the boys home to America to train. While the Americans are definitely out of their element in India — the boys, who have never left their rural villages — are equally challenged when they come to the States. As the boys learn the finer points of baseball — JB, with the help of his charming friend Brenda (Lake Bell) — learns valuable life lessons about teamwork, commitment and what it means to be a family. Training Camp – Actors Suraj Sharma and Madhur Mittal faced the same daunting challenge that their characters Rinku and Dinesh did—learning how to pitch a baseball. Their Story – The real JB Bernstein, Rinku and Dinesh explore the legacy of the Million Dollar Arm contest and its impact on the lives and aspirations of children in India…and their own lives as well. Million Dollar Music by A.R. Rahman – The Oscar-winning composer (Best Original Score, “Slumdog Millionaire,” 2008) talks about creating music that encompasses two worlds—India and the U.S. When I sat down to watch Million Dollar Arm, I was not prepared to be swept away with emotion. In fact, I pictured it as just another movie about baseball and hadn’t really given much thought as to what it was about. I’m not that crazy about sports to begin with and I’m so glad I pushed all my pre-judgments aside to watch Million Dollar Arm. It was one of the best movies I’ve watched all year and is so much more than a “baseball movie”. What makes the movie even more incredible is that it is based on a true story. It really did happen! I kept thinking what an experience it must have been for everyone involved especially those two young men from India. Their lives are completely different now and have new opportunities opened up to them thanks to the brilliance of one man named J.B. Bernstein. J.B. Bernstein was flipping through the TV channels when inspiration hit: find a cricket player in India to become the next big thing in major league baseball. It would open up the sport to 1 BILLION new fans. Cricket is big in India, but baseball isn’t. I have to say that it sounded like a pretty genius idea. This venture is J.B.’s last chance. His business as a sports agent is failing and if doesn’t work out, he could be out on the streets. I really wanted to see him succeed. Talk about culture shock when he gets to India! It’s like a completely different world. So many people and poverty is much more prevalent. And the honking! Apparently Indians love to honk their horns on their vehicles…just because. It was neat to travel around India and see the different sites including the Taj Majal. I doubt I’ll ever visit India so it was a little taste of their culture and way of life. Thousands of Indian males came to try out for the Million Dollar Arm and to win the money and a chance to play baseball in America. It was looking bleak until towards the end of the tour when Dinesh and Rinku showed off their incredible potential. J.B. knew he had a chance to really make this dream happen. Coming to the USA was a culture shock for Dinesh and Rinku who didn’t speak a word of English. Thankfully J.B. found a capable and enthusiastic interpretor in India who was willing to work for free. His character always brought a smile to my face. 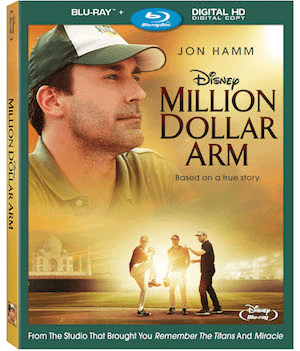 Million Dollar Arm demonstrates that even the impossible is possible. It’s a feel-good movie that will leave you feeling inspired and shows that one man’s big idea can be lifechanging for so many people all over the world. I’m so glad I watched it. Connect with Million Dollar Arm on Facebook. Missed this in the theaters, looking forward to watching the DVD! I have not seen this movie yet, this sounds like it is definitely worth the watch. Thanks for the review. I haven’t watched a baseball movie since Bull Durham and probably would have passed this one by. This movie would be exciting to see.My family loves baseball and I love true stories.Thanks for the great review on it. I havent seen this one and have been waiting for it to come out on DVD. This would be a nice weekend movie to watch when it is too nasty to go ooutside. It looks like a good one. This sounds like my kind of movie. My husband loves baseball and I think he would really like this movie. We all need more feel good movies. I had heard this was coming out. May have to watch it now- with or without kids! Sounds like a worthwhile movie! Sounds heart warming and a good family movie. It’s amazing the impact people can have on others and how sports can really bring that out. I like that it also has a real story bonus. I haven’t seen this yet, but I’ve heard good things from a few people now. I’ll definitely check it out soon. Sounds great!! Nice review thanks!! My dad would really like this movie by the sounds of it. Thanks for the review. I probably wouldn’t have chose to watch it so I’m glad you did this review. It sounds like a movie I would like, thanks. Thanks for the review!! I think this move might be a great compromise with the husband!! This sounds like a great movie to watch. Thank you for sharing with us. It is on our list of movies to watch so I am glad it is good! Thanks for your review! Thanks for the review, I’ve been meaning to watch this.